Myocardial infarction (MI) causes contractile dysfunction in the affected tissue, which can be assessed by using DENSE (Displacement ENcoding with Stimulated Echoes) to quantify myocardial strain[1, 2]. The aim of this study was to investigate changes in strain revealed by DENSE between the occurrence of MI and a 6 month follow-up, and the relationships with other clinical measures. 50 male patients (age 56 ± 10 years) underwent CMR on a 1.5T Siemens Avanto within 7 days of MI, and 47 returned for a follow-up scan after 6 months. The protocol included cine, DENSE (2D) and late gadolinium enhancement (LGE) imaging. Cine images were used to assess cardiac function by calculating LV ejection fraction (LVEF) and end-systolic volume (LVESV). DENSE and LGE were compared using a single mid-ventricular short-axis slice, which was analysed both as a whole slice and after division into 6 AHA segments. The percentage of each segment which contained LGE was calculated using a threshold of mean+5SD of remote myocardium intensity. DENSE images were analysed to obtain a value for peak circumferential strain (Ecc). 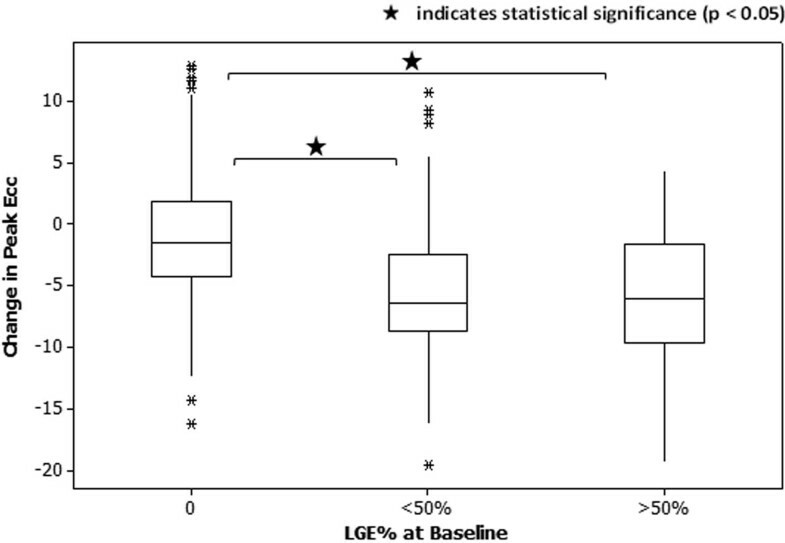 Segments in the baseline scans were grouped according to the extent of LGE (non-infarcted, <50% infarcted, >50% infarcted), and the change in peak Ecc between baseline and follow-up was evaluated using a one-way ANOVA with Tukey's post-hoc test. Individual patients were compared directly, and the correlations between change in strain and (i) change in LGE (segments) and (ii) change in cardiac function (slices) were assessed. Diagnostic images were obtained for 50 patients at baseline, and for 43 patients at follow-up. The results of the group comparisons and the individual patient comparisons are illustrated in Figure 1 and Figure 2 respectively. Strain recovery was disclosed by DENSE in infarcted tissue at 6 months post-MI. An increase in peak Ecc at follow-up is associated with a reduction in LGE, and improvement in LVEF and LVESV. Further work is required to take infarction in adjacent segments and slices into account, as this may provide a more precise insight into the relationship between myocardial strain, LGE and cardiac function.